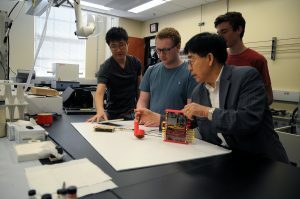 Dr. Yang-Ki Hong, foreground, discusses the antenna system in his lab with team members, from left, Hoyun Jay Won, Leo Vanderburgh and Jonathan Platt. TUSCALOOSA, Ala. — For the second consecutive year, a team of engineering students at The University of Alabama is one of six selected as finalists in an international contest to design an antenna system to sound wireless channels and locate radio signals. “We are very fortunate because this is a worldwide competition, so we are very happy our students were one of the top six,” said Dr. Yang-Ki Hong, team adviser and the E. A. “Larry” Drummond Endowed Professor of Electrical and Computer Engineering in the UA College of Engineering. The Student Antenna Design Contest is held by the Antennas and Propagation Society of IEEE, or IEEE AP-S, the world’s largest technical professional organization dedicated to advancing technology. The UA team won the contest a year ago. The six finalists receive stipends to help develop the antenna system and travel to the annual IEEE Antennas and Propagation Symposium this month in Boston. Along with UA, the finalists include teams from Michigan State University, Colorado School of Mines, two teams from Greece and a team from Spain. The UA team is made up of three undergraduate students and a graduate student in Hong’s lab. The challenge this year was to create a portable device to locate in real time a hidden radio transmitter at the frequency of a common wi-fi router, as opposed to the lower frequency used by amateur radio enthusiasts in transmitter hunting contests. The possible applications, especially if tuned to higher frequencies used by mobile phones, include search –and-rescue operations and wildlife management. The compact, low-cost device designed by the UA engineering students uses a four-pronged antenna system to create a Doppler shift to discern shifts in the signal that can help reveal the location of the source of a radio signal. As stipulated in the contest rules, the device also uses channel sounding technology to sift out the signal’s location around obstacles such as walls in a building that can block or create multiple ways for a signal to travel. “To our best knowledge, nobody has fabricated the antenna system that has the capability of both radiolocation and channel sounding,” Hong said. Hoyun Jay Won, a graduate student from Incheon, South Korea. Katelyn Isbell, an undergraduate student from Chesapeake, Virginia. Leo Vanderburgh, an undergraduate student from Dayton, Ohio. Jonathan Platt, an undergraduate student from Lumberton, New Jersey.